For you Ferrari fanatics out there. Check out the Acer Ferrari 5000 Laptop. It looks so damn sleek. I love the carbon fiber casing and Ferrari red accents. If you’re a high-performance PC junkie, you’ll love the racecar fast Acer Ferrari 5000-5832 Laptop Computer with its brilliant 15.4-inch WSXGA+ (1680 x 1050) display. 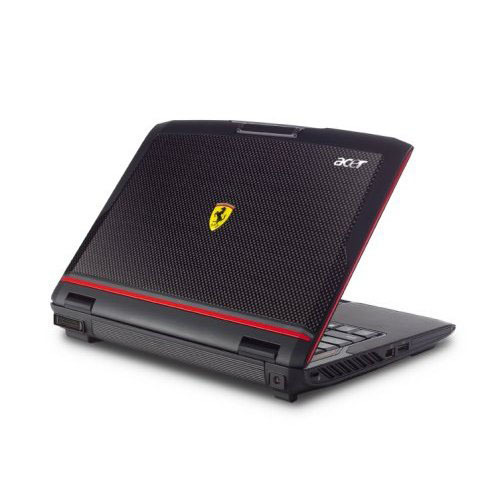 True to its genuine Ferrari colors, this sensational new 6.6-pound notebook runs laps around the competition with a powerful 2.0GHz AMD Turion™ 64 X2 Dual-Core Mobile Technology TL-60 processor, 2GB DDR2 667 SDRAM memory, and 160GB hard drive. Running on the elite Windows Vista Ultimate operating system, the Acer Ferrari 5000-5832 boasts an integrated HD DVD-ROM drive (CD-ROM, CD-RW, DVD+R, DVD-R, DVD-RAM) optical drive, fabulous ATI Mobility Radeon X1600 graphics, and a sensational array of communications options, including 802.11a/b/g wireless, Bluetooth 2.0 EDR (enhanced data rate), gigabit LAN, and a V.92 modem. And the Acer Ferrari 5000-5832 even comes with a Bluetooth VoIP phone and an integrated Acer OrbiCam camera! Other great features include a 5-in-1 media card reader, HDMI (High-Definition Multimedia Interface), FireWire, S-video TV-out, and a connector for an optional ezDock docking station. And you’ll pilot this luxury laptop computer in supreme comfort with its 88-key Acer FineTouch keyboard with its five-degree curve, inverted T cursor layout, embedded numeric key, and convenient hotkey controls. A powerful 9-cell lithium ion battery will keep your blazing fast Acer Ferrari 5000-5832 laptop computer running for up to 3.5 hours. For high-speed computing, masterful entertainment, and legendary performance, order the Acer Ferrari 5000-5832 Laptop Computer today! -Acer Video Conference is an integrated VVoIP (Video and Voice over the Internet) solution supporting widely used IM protocols like Skype, MSN and Yahoo! Get yours at Comp USA.